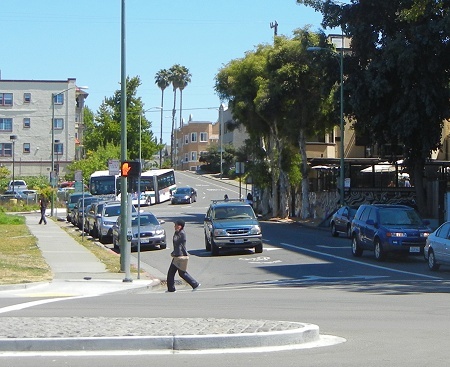 Foothill Boulevard descends to Lake Merritt in this gentle slope down from the old marine terrace (Clinton terrace). For a mile and half east from here, Foothill runs along the terrace. East of 14th Avenue, where it’s a two-way street, it skirts the steep edge of the Fan at San Antonio hill where the contrast between the two geologic units is most dramatic. This entry was posted on 6 August 2013 at 10:08 am and is filed under Oakland geology views. You can follow any responses to this entry through the RSS 2.0 feed. You can skip to the end and leave a response. Pinging is currently not allowed.